It's big. It's bad. It's Boozy Beef Chili. 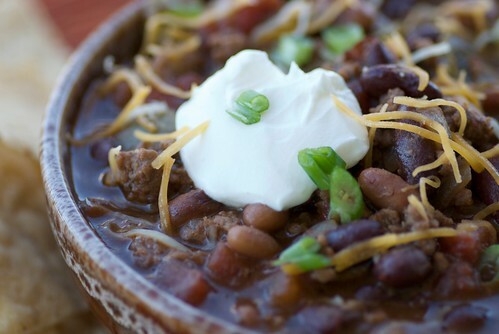 Full-bodied porters or stouts, such as Guinness, add complexity and depth to otherwise ordinary beef chili. Make it for St. Patrick's Day or anytime you feel like having a belly-filling bowl of hot chili. 1. In a large pot over medium-high heat, saute onions and pepper in oil for 5 minutes. Add meat. Cook until browned, about 10 minutes. Stir in spices and sugar. Add beans, tomatoes, and beer and stir. Bring to a boil. Reduce to low and simmer for 20-25 minutes, or until thick and soupy. Stir in cornmeal if you want the chili thicker. Taste, and adjust seasonings as necessary. 2. Top servings with any of the following: shredded Cheddar cheese, sour cream, diced avocado, sliced green onions, or fresh cilantro. This chili tastes even better the next day. With this wintery weather, that chili is excatly what I'd need to comfort me! Guiness would be perfect for this hearty stew Susan. Erin go braugh. rosa-I find chili endlessly comforting too. val-I may be saying that pretty soon if I keep this up! love your title, boozy beef so perfect for St. Patrick's and this rainy weather right here. Oh, this sounds so warm and yummy. My hubby has been bugging me for chili! This looks perfect...I'm sure he'll love it even more with the beer! It may be big and bad, but I bet it tastes brilliant... I'm familiar with boozy stews, but loving the idea of a boozy chilli, too. And why not! This sounded so good that I had to make it for St. Patrick's day. The only problem was that I didn't have any Guiness. However, I did have Pipeline Porter, so that's what I used. Those coffee and chocolate undertones really enhanced the flavor of the chili. And, after re-checking your blog stories, I now remember where I saw mention of PP. Duh. Thanks for providing such delicious recipes! Mighty tasty chili! Served over plain macaroni, it was the greatest comfort food I can imagine. Thanks for sharing the recipe!